The U.S.'s largest bookseller, Barnes & Noble, will not sell O.J. 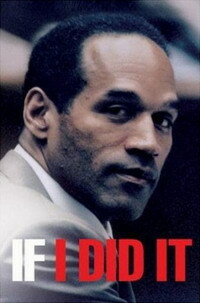 Simpson's "If I Did It" because of perceived lack of customer interest in the book. "Our buyers don't feel there will be enough of a demand to carry it in our stores," Barnes & Noble spokeswoman Mary Ellen Keating told The Associated Press on Tuesday. The book will be available only by special order or for purchase online through Barnes & Noble.com. A rival chain, Borders Group Inc., said Tuesday that it would stock "If I Did It," a ghostwritten, fictionalized account of the murders of Simpson's wife, Nicole Brown Simpson, and friend Ronald Goldman. But spokeswoman Ann Binkley said Borders "will not promote or market the book in any way." "We think it will have some interest in the first week or two, then die down," said Binkley, who added that Borders, which for the original book had planned to donate profits to charity, will not do so this time. Simpson's book was originally scheduled to be published last November by ReganBooks, an imprint of HarperCollins, with an announced printing of 400,000. But "If I Did It" was dropped in response to widespread outrage. ReganBooks founder Judith Regan was later fired and her imprint disbanded. "It is Barnes & Noble's decision, not my decision, and the marketplace will determine whether they are right or not," said Eric Kampmann, the owner and president of Beaufort Books, the new publisher of "If I Did It." "But I think it's sad if they're making their decision based on the HarperCollins experience, which was a totally different situation." Last month, a federal bankruptcy judge awarded rights to the book to Goldman's family to help satisfy a $38 million (28.13 million EUR) wrongful death judgment against Simpson. Beaufort Books, a small New York-based publisher, is reissuing "If I Did It" in October, with Simpson's original manuscript intact and commentary included. The Goldman family is calling the book Simpson's confession - the same description Regan offered in justifying the original publication. Denise Brown, Nicole Brown Simpson's sister, has accused Goldman's father, Fred Goldman, and other family members of hypocrisy for publishing a book that he had called "disgusting and despicable" when Simpson first planned to publish it. Simpson has maintained his innocence in the 1994 killings in the Brentwood section of Los Angeles. The former actor and professional football great, who now lives near Miami, was acquitted of murder in 1995.